Ready for School? Make Sure those Vaccine Records are Up to Date! Send Your Children Back to School Protected from Serious Diseases. Back-to-school season is here. It’s time for parents to gather school supplies and backpacks. It’s also the perfect time to make sure your children are up to date on their vaccines. One of the most important things a parent can do to protect their child’s health is getting their child vaccinated according to the recommended immunization schedule. 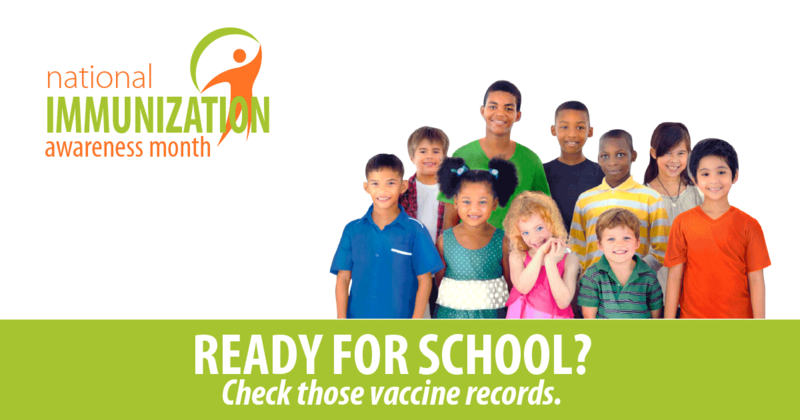 Whether parents have a baby starting at a new child care facility, a toddler heading to preschool, a student going back to elementary, middle or high school – or even a college freshman – parents should check their child’s vaccination records. Child care facilities, preschool programs, schools and colleges are prone to disease outbreaks. Children in these settings can easily spread illnesses to one another due to poor hand washing, not covering their coughs and sneezes and other factors related to interacting in crowded environments. Serious health consequences can arise if children are not vaccinated. Without vaccines, children are at increased risk for disease and can spread disease to others in their play groups, child care centers, classrooms and communities. This includes spreading diseases to babies who are too young to be fully vaccinated and people with weakened immune systems due to cancer and other health conditions. Additionally, states may require children who are entering child care or school to be vaccinated against certain diseases. Colleges and universities may have their own requirements, especially for students living in residence halls. If you haven’t already, check your child’s immunization record and schedule a visit to their physician or clinic. Doing so now will avoid a potential last-minute rush and will help ensure there are no surprises on the first day of school.